Quoting his father, young indoor housepainter and unlikely philosopher Sid (Eric Stoltz) advises Beth (Bridget Fonda) that “if you stay in one place long enough, luck knows where to find you.” Of course, Sid, unlike the often transient characters in Waterdance director Michael Steinberg’s Bodies, Rest & Motion has lived in small, sticky and desolate Enfield, Arizona his entire life. Based on the play by Roger Hedden and adapted by the scribe for its cinematic transfer, Bodies, Rest & Motion never fully abandons its theatrical roots and staginess in this conversational ensemble chamber piece which takes place over roughly forty-eight fateful hours in the lives of four aimless twenty-somethings. Waiting until the night before he and his live-in girlfriend Beth are planning to move to Butte, Montana which he’d read is “the city of the future,” to tell his old flame and Beth’s best friend Carol (Phoebe Cates), slightly sleazy, rootless and irritable fired television salesman Nick (Tim Roth) is the type of guy who inexplicably attracts great women and just as inexplicably escapes from their lives, hoping that he can leave his boredom and problems behind the more miles he puts between himself and his old life. Taking off without Beth, Nick opts for what he thinks is an easy out, bolting from Arizona and later calls Carol who must break the news to his girlfriend. Understandably upset yet I think deep down resigned to the fact that Nick is who he is, Beth ends up seeking solace with adoring Sid who takes an immediate liking to Beth when he arrives to paint the place in readiness for the next tenants but takes his time and gets involved in the goings-on. 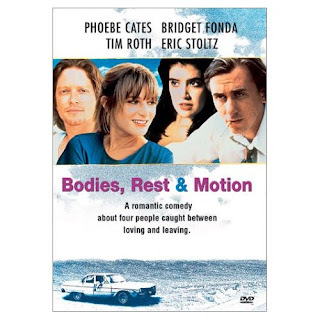 Nominated for the Grand Jury Prize at the 1993 Sundance Film Festival and winner of the Director’s Week Award at Fantasporto, Bodies, Rest & Motion benefits from intelligent source material but doesn’t manage to hook its viewers until a little over the half hour mark after unlikable and self-absorbed Nick makes his getaway. The authentic sounding Native American score is wonderful but it doesn’t fit in with the piece and makes the film call too much attention to itself. However, the actors (especially Stoltz and Fonda) all keep us watching, even when one realizes that it’s essentially a southwestern Reality Bites and may have been superior on the stage.